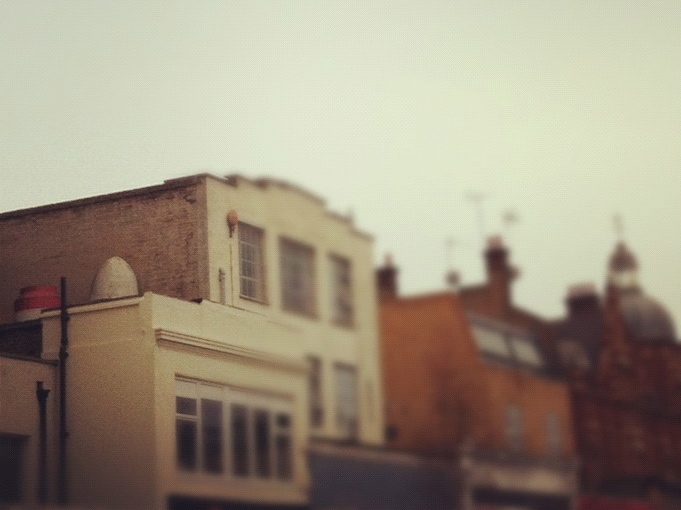 There’s a nuclear missile on the roof above a vintage clothes shop on the Holloway Road. You have to look carefully, but it’s there. It’s that egg-like object in the photo above. Or at least that’s the top of it, the red thing next to it is the base. No, it’s nothing to do with our upcoming sports extravaganza. It’s been there for years. It’s also bloody heavy, though it’s well over a decade since I handled the thing. It’s not a real nuclear missile. It’s a model. It belongs to CND, whose offices are also above said vintage clothes shop. They have an inflatable one these days, but the “missile” used to tour round the country every summer as a way of taking military technology to the people. Or at least it took a talking point for discussing such objects, in absence of the real thing. It’s not like the MoD are going to let CND play with an actual one. The Holloway Road missile is only one in a cast of mockups of technological or natural objects used by campaigners. There was the whale the World Wildlife Fund drove down the Thames in February, or Greenpeace’s “polar bears” that sprung up in cities across the world last week. I walked by some orangoutangs outside on Tottenham Court Rd a few weeks ago too, protesting about deforestation. Environmental activist orangoutangs, it turns out, wear sandals (it was really hot that day). My favourite is probably Water Aid’s giant river crafted from 100s of blue squares posted by an international network of knitters; a wooly petition which ended up draped over the National Theatre. Those are all clear, explicit fakes. They’re not mermen. They’re not designed to con. They are not even trick-then-reveal projects like the Yes Men Arctic Ready site or the OFT fat melting pads. Such overt fabrications are openly designed to expose those bits of the world which are too far away, too dangerous, too secret or too unruly to be experienced directly by most of us. They’re a moment of spectacular, a slight subversion of the world designed to draw attention and inspire learning or action. They are falsehoods in a way, but there to express something people feel very strongly is important and true. They bring a bit of reality to us by being unreal. It’s not just activists who engage in such subverted realism. It’s a quite routine part of the public communication of science, technology and the environment. Metaphor or analogy in text, CGI or filming “under controlled conditions” for a documentary. I think museums provide the best examples though. Museums of science and technology often have to find inventive ways to fit the large, dangerous or simply abstract things they curate into a glass case: Einstein’s chalkboard, Galileo’s finger, Florence Nightengale’s moccasins, models of boats, a bowl from Hiroshima. My favourite example of this has to be the Science Museum’s DNA model. 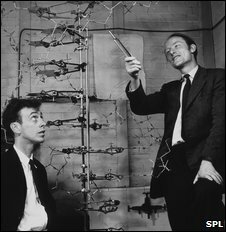 They wanted to display the model from the iconic 1953 Watson and Crick picture. Except the people in the lab had taken the model apart to reuse after the photo was staged. The museum dug out the old pieces from the back of a cupboard, dusted them down and rebuilt the model. It is a mockup, albeit an official one, unveiled by Watson himself, but a mockup nonetheless. When it comes to the bits of the world natural history museums want to encase, once living things are often pickled, stuffed or rebuilt from fossils (though they model too, from the Crystal Palace dinosaurs to modern animatronic models or IMAX movies) . With the recent death of “Lonesome George” the Galapagos giant tortoise, there’s been some interesting debate over what to do with his body. Henry Nicholls argues we shouldn’t stuff George, writing a thoughtful piece about the politics of preserving other iconic animals (though I wondered why he didn’t mention Jeremy Bentham). In contrast, Paolo Viscardi stresses museums’ role as research institutions as well as public communication, saying George should be preserved for science. Both pieces are worth reading. Incidentally, Viscardi works at the Horinman, which is where the merman I linked to earlier resides, and also contains the most amazing inaccurately overstuffed Walrus (one of the many museum exhibits which tweet a form of post-mortem anthropomorphic existence). I can also recommend this piece by Phillip Hoare on how to remember the whale that died in the Thames a few years ago, or the Brown Dog statue in Battersea‘s worth a visit. I’m rambling. My point is that we all do a lot of fictional work to have non-fictional discussion and fabricate things in order to debate things we hold as truths. It’s normal, it’s necessary and to think otherwise is just a bit limiting. The trick is to consider which bit of reality we want to communicate, and stay as true to that as you can. If anyone has any other examples of fabricated, refashioned or reconstructed aspects of science, technology or the natural world used for public communication, I’d love to hear them. Bet there’s loads of ageing science props hidden in store cupboards of museums, NGOs, schools and film studios the world over. This entry was posted in art, campaigning, museums, science and tagged art, campaigning, museums, objects, science on June 29, 2012 by alice.